What could be better than after a long day of having some serious knowledge dropped on you than showing off your ability to recall trivial facts at a moments notice? 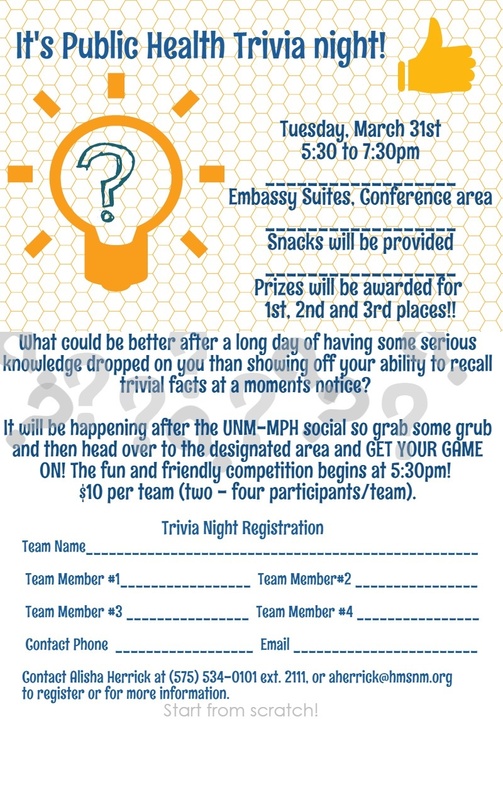 It will be happening after the University of New Mexico MPH Social so grab some grub and then head over to the designated area and GET YOUR GAME ON! The fun and friendly competition begins at 5:30 pm. Prizes will be awarded for 1st, 2nd, and 3rd place! Contact Alisha Herrick to register or for more information at (575) 534-0101 x 2111, or by email at aherrick@hmsnm.org.